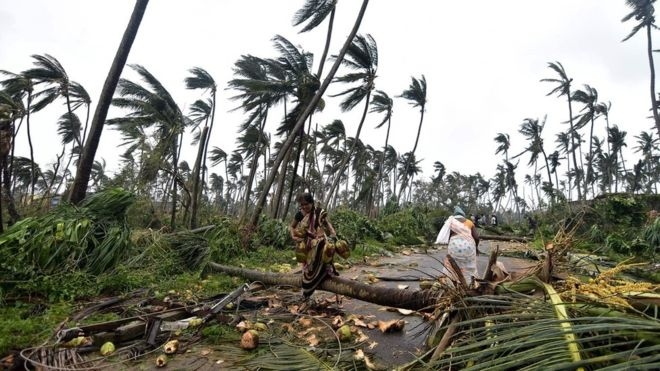 AKIPRESS.COM - A powerful cyclone has swept into eastern India, leaving at least eight people dead and destroying hundreds of homes, BBC reports. About 300,000 people have been evacuated from low-lying districts in Orissa. Authorities say roads are blocked and power supplies have been lost in many areas. "We fear that 6,000 to 7,000 electricity poles may have been uprooted," K Dhananjaya Reddy, the district administrative chief of Srikakulam district in Andhra Pradesh, told Reuters news agency. The eight reported deaths were all in Andhra Pradesh. The state's disaster management chief, D Varaprasad, said that shortages of drinking water were a concern in many areas. Those evacuated were accommodated in more than 1,100 cyclone shelters, state officials added. TV footage from the affected areas showed huge waves crashing on to beaches and trees and power lines being toppled.